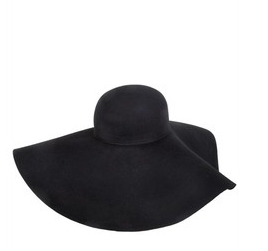 NYC ladies can’t seem to get enough of felted wool floppy hats. The Downtown glam girls love this chic style. It’s not too late to get this look. The best thing is as new trends pop up, prices for previous trends drop down. If you’re headed out for dinner in the City, Throw a felted wool floppy hat on with a fabulous short, wool, double-breasted empire coat and leather gloves. Complete the look with a pair of black tights and stiletto knee boots. The full number is ultra chic and major yummy! Categories: Fashion and Beauty, What's Hot in N.Y.C.